Today is farmers market day when I head downtown to Union Square and check out what the farmers are growing. I love weekends, New York is so relaxed! People are cheerful and talkative, the city shines, people are out and about celebrating, it's easy to see why people gravitate towards this city. I love the farmers market, people bring their dogs, they walk around munching on produce, if you're me, you're buying a vegan muffin and everyone has giant cups of coffee. Today was like summer meets fall; the sun was bright and warm but the breeze was chilly and autumnish. Such a beautiful day, such beautiful fall produce. I bought my usual kale, potatoes, tomatoes but I also found spaghetti squash, which I plan to make like pasta (recipe coming) and I also bought another cabbage. I love baking cabbage in spices. After the market, I stopped at Whole Foods just to get oats and peanut butter but then I saw canned organic pumpkin on sale and I had to get it. I also had to pick up some coconut cream. Then this recipe came to me and when I came home I made it. I taste tested the batter so much that I couldn't eat the finished product so it will be tomorrow's breakfast. 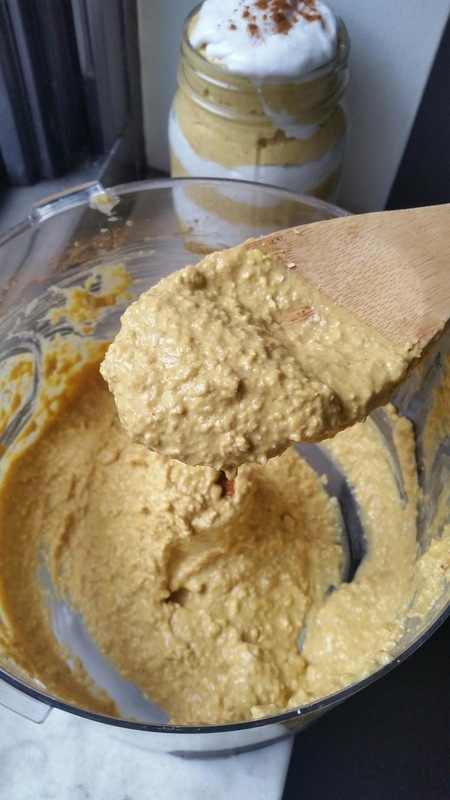 Cake batter that is healthy, cream that is healthy, OMG, how much better can you make it? How awesome is it that this can be breakfast or dessert. Either way, you got fiber and healthy fat coming into your body. Love, love and more love. In your food processor, mix together the oats, milk, maple syrup, cinnamon and pumpkin until you get a thick batter (see below). 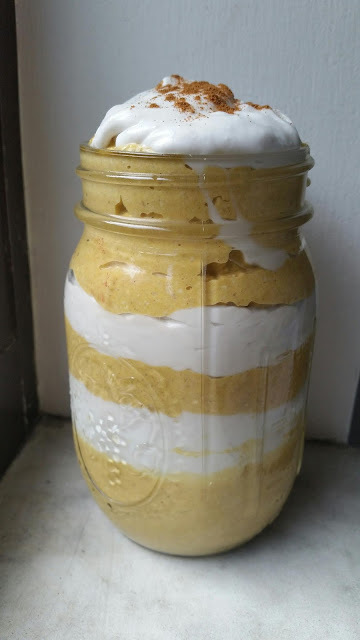 In a small mason jar, spoon the batter into the jar. Spoon the coconut cream out of the cans into a small bowl and mix quickly with a spoon. Scoop the cream on top of the batter in the mason jar. 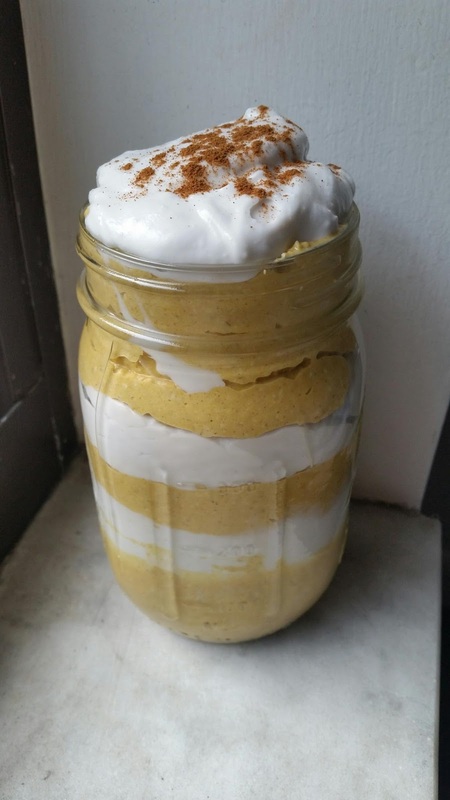 Keep layering the pumpkin cake batter oats and the cream. Finish the parfait with the cream and sprinkle some cinnamon on top of the cream. 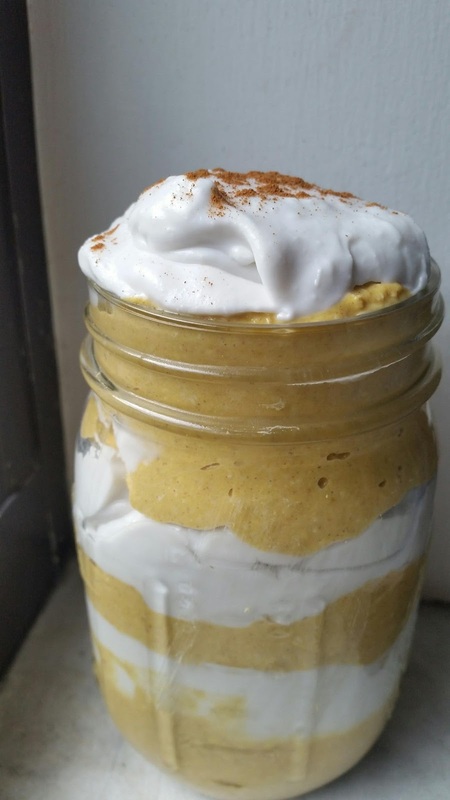 This may be hard to eat because it looks so beautiful in the mason jar! Notes: use any sweetener you wish but I'm obsessed with maple syrup lately. You can play around with how much pumpkin you put in so add more if you wish. I used oat milk but coconut milk would work great too...actually any non dairy milk will work. Branch out and try hemp or rice milk. 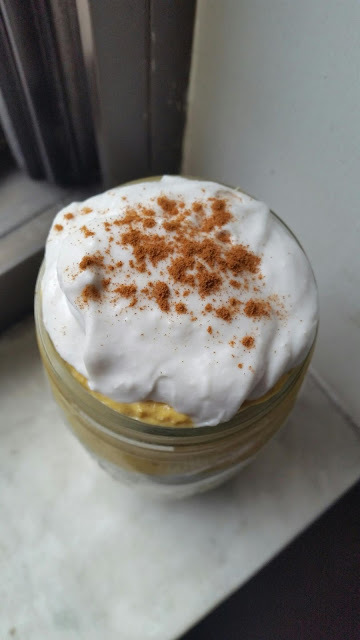 Instead of buying coconut cream, you can buy a can of full fat coconut milk, flip it upside down in the fridge overnight and then whip up the solid part into cream. Love my recipes? Sign up here to get my recipes delivered right to your inbox!